The all new FULLBACK JOCKSTRAP is made out of high quality Polyester and Spandex material with 2 way stretch for fit, comfort and recovery.The new and updated look of your classic "Jockstrap" is sure to win you over. 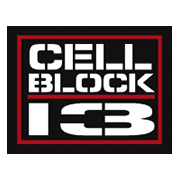 White rectangular care label is on the center with CellBlock13 logo. One inch elastic leg straps.